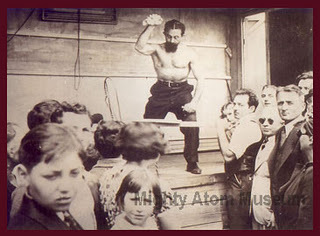 A collection of Quotations about Famous strongmen - strongwoman Jews. The following is a list of Famous Jewish strongmen - strongwoman. Click on the photo to enlage it. 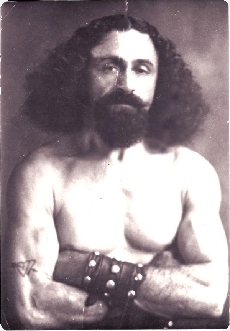 Abe Attell, who was featherweight champ from 1901–1912, was known as the "Little Hebrew" strongmen. An inveterate gambler, Attell frequently placed bets on himself to win. After a successful career, he was indicted as Arnold Rothstein’s bag man in the World Series fix of 1919. 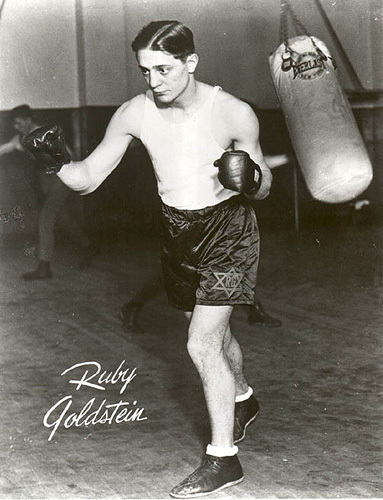 Ruby Goldstein was known as the "Jewel of the Ghetto" and was regarded as an excellent fighter, but with a frequently shattered glass jaw. 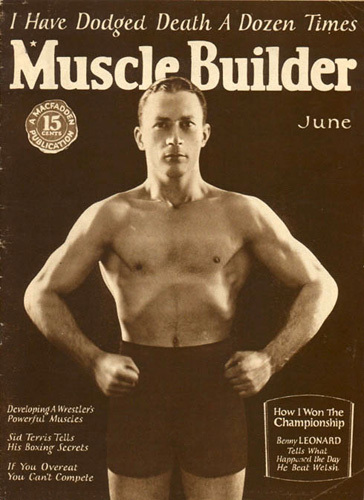 Benny Leonard was considered one of the top lightweights in the history of boxing and was world champion from 1917–1925. One of America’s best-known fighters, columnists wrote that he was a more important Jew than Einstein, simply because more people knew who he was. 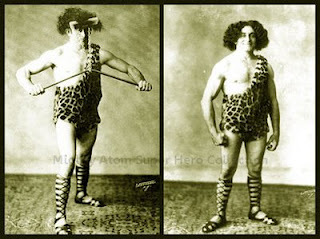 Born in a suburb of Warsaw, Abie Coleman had a stellar career as the Jewish Tarzan and later as the Hebrew Hercules. He is said to have invented the drop kick while on tour in Australia after having seen kangaroos do it. At only five foot three, and 200 pounds, he was a tank. Abie Coleman died in 2007 at the age of 101. Rafael Halperin, who was born in Vienna, but moved to Palestine as a child, studied in a Bnei Brak yeshiva with the famed rabbi Hazon Ish. As a yeshiva student, he became interested in physical culture and began a regimen of weightlifting. 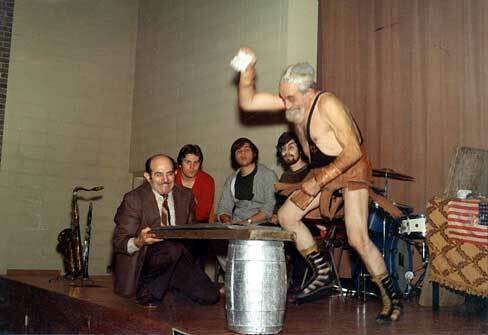 Though his family and friends thought it bizarre, his athletic activity led to his becoming Mr. Israel in 1950. 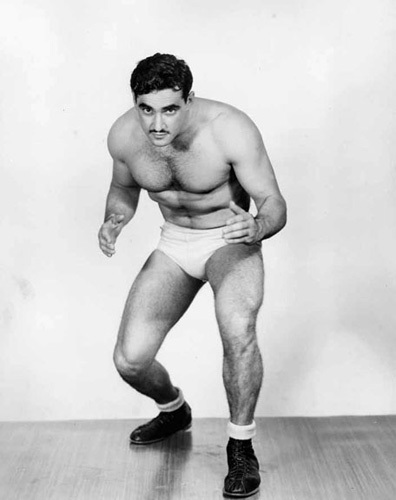 An American Jewish promoter brought him to the States, where he began a wrestling career. Notably, he did not wrestle on Shabbos. Upon retiring from the ring, he returned to Israel and founded a number of businesses, the most successful of which was Optika Halperin. Halperin returned to Bnei Brak and became a Haredi, or ultra-Orthodox, rabbi. 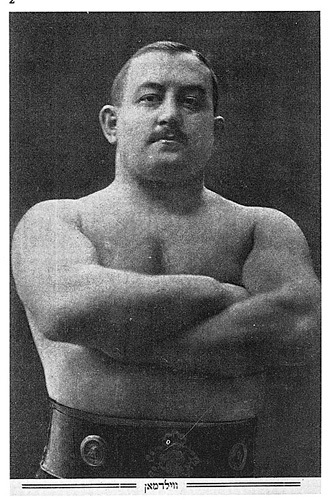 Avrom Vildman was the most popular Jewish professional strongmen wrestler in Poland before World War I. 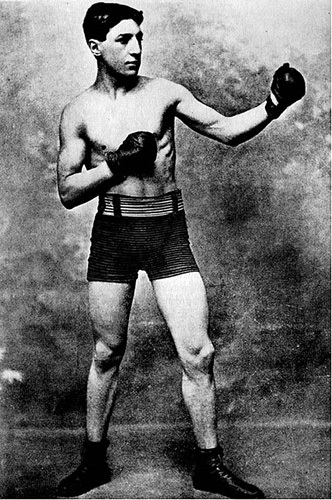 It was reported in the Warsaw Yiddish press that when Vildman was doing badly in the ring, the Jewish audience would begin to sing psalms. 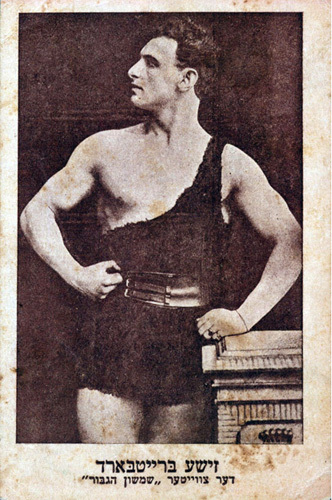 The most popular Jew of the early 1920s was the "Iron King," Zishe Breitbart (aka Siegmund Breitbart). Breitbart created a refined strongman act in which he bent iron bars, bit through iron chains with his teeth, laid down on beds of nails and had bulls, elephants, and cars driven over him. Siegmund "Zishe" Breitbart was born in Lodz, Poland in 1883 to an Orthodox Jewish family in which many members were professional blacksmiths. Drafted into the Russian Army during World War I, Zishe Breitbart was taken prisoner by the Germans but remained in Germany after the war. 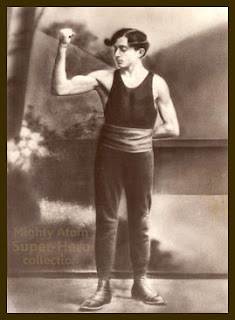 Zishe Breitbart became a strength star in the early 1920s. He arrived in America in August 1923. Zishe Breitbart rolled half inch metal bars into scrolls, broke spikes with his bare hands and hammered nails through three one-inch planks of wood, pulled wagons full of people with his teeth. A routine where two men chased each other with motorcycles ridden over his chest. 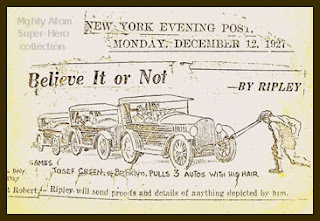 While on tour in Europe in 1925, a rusty nail pierced his body and Breitbart died on October 12, 1925 at the age of 42. 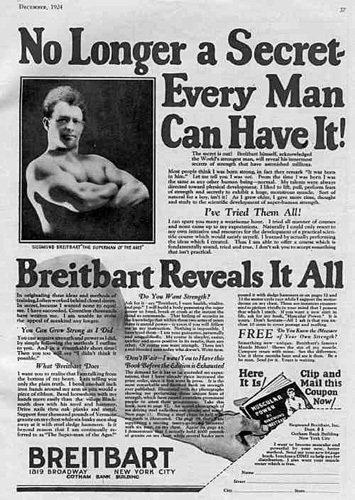 Breitbart's strongman act was big business and he created his own mail–order exercise regimen called "Breitbart’s Muscular Power." A routine where two men chased each other with motorcycles ridden over his chest. Lying on his back and supporting cars filled with up to ten people on his chest. Bending iron bars into floral patterns, biting through chains and tearing horseshoes apart. Pulling wagons full of people with his teeth. 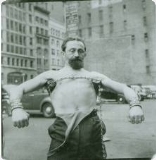 Supporting a bridge built across his chest while elephants were paraded over him. This routine was called the Tomb of Hercules. Lifting a baby elephant while climbing a ladder and holding a locomotive wheel in his teeth with three men suspended from the wheel. 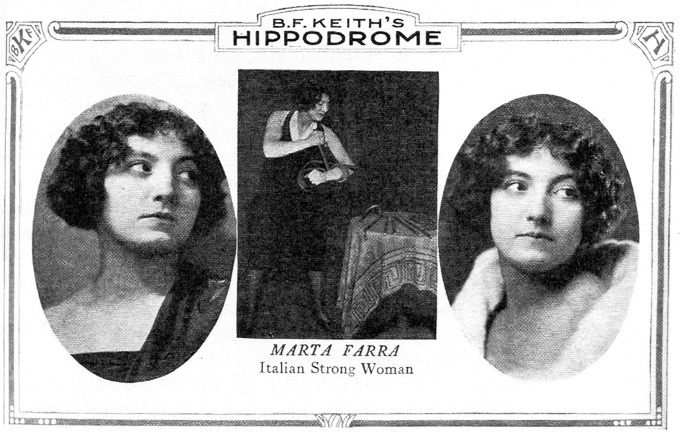 Though not out as a Jew, strongwoman Martha Farra’s real name was Martha Cohen. Farra was the creation of psychic Erik Jan Hanussen (né Hersh Steinschneider), who, attempting to capitalize on the incredible popularity of Zishe Breitbart, would hypnotize her and control her super-strength. Though women tended to get less play in the realm of body exhibition, a number of beauty pageants took place in which Jewish women took the crowns. Included among the major winners was Lisl Goldarbeiter, who won the 1929 Miss Universe pageant. Smaller pageant winners included Brooklyn’s Hannah Goldberg, who took the Miss Flatbush crown. Greenstein was born in Suvalk, Poland in 1893. As a child he suffered from respiratory ailments, and at age 14, a team of doctors predicted he would die from tuberculosis. 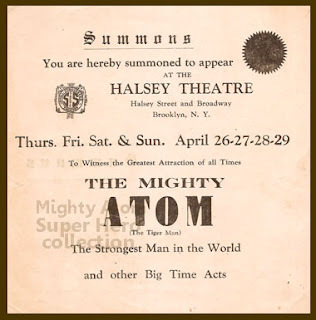 Around that time, he became acquainted with a Russian circus strongman called "Champion Volanko," who took Greenstein under his wing. 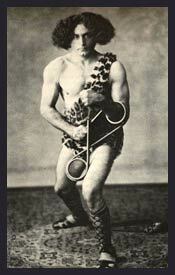 Greenstein traveled with Volanko and the Issakoff Brothers' Circus for eighteen months, learning the strongman's training regimen. After this, he returned to Poland and married his wife, Leah, and began a career as a wrestler. Due in part to rising anti-Semitism in Eastern Europe, he then left for the United States. Driving 20 penny nails through a 2½ inch board with his bare hands. 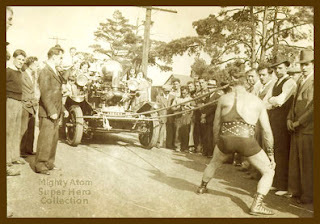 Lying on a bed of nails while supporting a 14-man Dixieland band on his chest. Please send me email with famous Jewish strongmen who is not in our list, and I will add it to this page.